Korg's latest recording product is an eight-track, eight-channel, eight-buss recorder, priced competitively at just under £550 in the UK. What's quite unusual about it is that it has been designed to look and feel like an eight-channel analogue mixer rather than a state-of-the-art digital recording device. Digital-multitrack designers usually include no more than a few task-assignable channel parameter knobs for all hands-on EQ and effect adjustments, yet the D888 has a knob for every EQ band, effect-send buss and channel pan, all laid out in traditional mixer style. Korg have even been crafty enough to give the recorder something (to my eyes) of the look of a Mackie mixer, using white screen-printing on a charcoal-grey chassis. Appearances aside, the D888 has enough recording and editing features for the production of good demos, or even for relatively unprocessed album material, and certain of its features make it well suited for capturing material on location, which is then transferred to computer for further processing. Making use of a hefty 40GB internal hard drive, the D888 simultaneously records and plays back eight tracks of 16-bit uncompressed audio at 44.1kHz. The internal signal path is rated at 40-bit, so there's plenty of headroom in the system for mixing and processing. Each record track has seven additional virtual slots for storing alternative takes, and there's the option of saving the final mix as multiple stereo WAV files. These can be transferred to a computer via USB 2.0, as can song-file backups. The D888 does have on-board effects, but the options are limited to a collection of 11 reverbs and echo effects, with the only editable parameter being reverb or echo time. (Even Korg's diminutive D4 multitrack included modelling algorithms for processing guitars, plus a selection of other common effects, such as flangers, choruses and tremolos.) It seems that Korg have followed analogue mixer protocol, where it's common to have some general reverbs and delays on board, but all other effects are left up to the musicians and their choice of outboard. The channel EQ is a simple, non-sweepable, three-band design, offering +/-15dB gain on bands centred at 100Hz, 2.5kHz and 10kHz. The digital editing facilities on board are basically Delete, Copy, Erase and Swap, but it's also possible to bounce tracks down, and perform punch in/out recording. MIDI spec, again, is quite basic. The single MIDI output only seems to transmit MIDI Time Code (MTC), at a fixed frame rate of 30fps (frames per second). MIDI clock is not supported at all, nor is MIDI Machine Control. 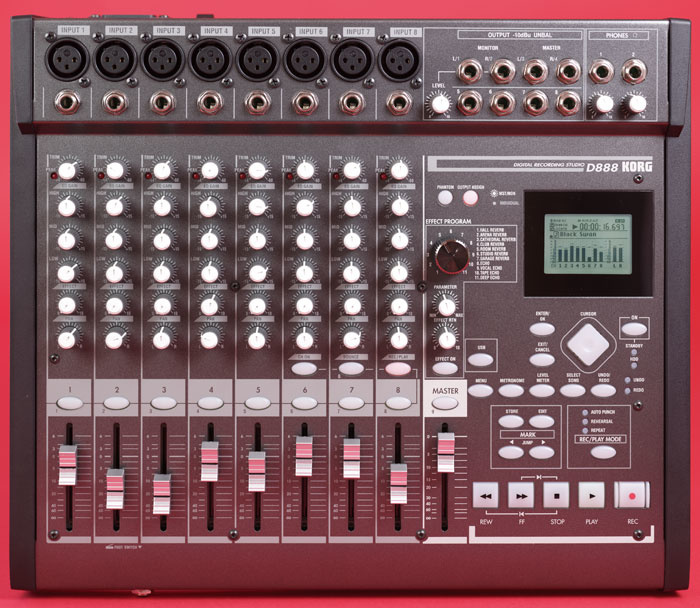 Encouragingly, the D888's metal chassis is very robust, as is the fixing of all the connector sockets, but the feel is let down a little by some rather flimsy knobs and faders. Ergonomically speaking, the layout is very neat, placing channels and inputs in-line on the left, the control section under the right hand, and the analogue I/O across the top. All the channels are identical, so it doesn't matter that Korg have avoided implementing a patching matrix by hardwiring every input to its numerical equivalent record track. Each channel has an XLR mic and quarter-inch jack socket, and 48 Volts of phantom power is available to the XLRs. However, it can't be selected individually, so if it were being used to power a set of condenser mics, any dynamic mics would have to be connected via the jacks to avoid damage. Next in the signal path is a gain-trim knob with a 60dB range, followed by a signal peak LED and the A-D converter. The signal path continues through the EQ, effects send level knob, pan control, channel on/off switch, and finally to a 45mm fader. During record monitoring, the results of effects or EQ settings can be heard, but these are not 'printed' to disk until the signal is bounced or mixed. 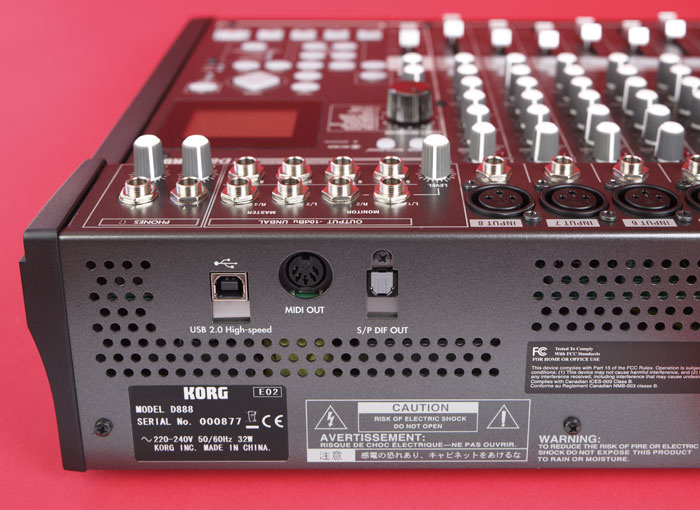 The rear panel is rather bare, hosting just the power switch and mains inlet, plus three other sockets unambiguously labelled MIDI Out, S/PDIF Out (optical format) and USB 2.0.The most unusual characteristic of the D888, and possibly a big selling point, is the way the analogue output section has been designed. The eight quarter-inch jack output sockets operate in either MST/Monitor or Individual mode. In the former mode, outputs 1 and 2 function as a typical Left/Right pair, carrying a copy of the stereo mix. Their level can be adjusted by turning a dedicated gain pot, enabling the signal to be attenuated when fed to studio monitors. Outputs 3 and 4 perform in exactly the same way, but have no gain control and are more suitable for use as Master outputs. The remaining sockets, numbered 5-8, output the signals from channels 5 to 8 respectively. Nothing too remarkable so far, but when switched to Individual mode, the Monitor and Master pairs become outputs for tracks 1-4 — so, together with outputs 5-8, they provide an output for every track, which is potentially extremely useful. For example, you could use the D888 to make some high-quality recordings for demo purposes, then, if at a later date the chance arose to remix the project using a bigger and better system, the individual tracks could be fed simultaneously into the relevant DAW. It would also be good for making live recordings (of a band, say) which could similarly be transferred to computer. Having direct outs from every track is very nice, and unusual, to find in a digital multitracker design. Other products that have similar options usually require the installation of additional I/O boards. It's worth noting that the signal is output before it reaches the channel fader, effects send, pan or master fader control, so if the EQ is set flat, the output provides an exact copy of what's on the hard drive, plus one stage of D-A conversion. Aside from the channel inputs and eight outputs, the only other I/O on the top panel is the two headphone outs, each with its own independent level control, making it possible for an engineer and performer to be connected at the same time — a nice touch. The only feature on the front edge of the unit is a footswitch jack socket for use when performing remote punch-in/punch-out recording. The rear panel is also rather bare, hosting just the power switch and mains inlet, plus three other sockets unambiguously labelled MIDI Out, S/PDIF Out (optical format) and USB 2.0. It wasn't so long ago that CD-RW drives were a must-have feature for any half-decent digital studio, but USB has gradually begun to take over as the primary method of performing backups. The first recorders to be given USB facilities performed rather slowly, because the proprietary formatted audio data required decoding. Now it's becoming common for multitrackers to record in the WAV file format, which speeds things up considerably. However, WAVs tend to be relatively large files, so a single CD-R's capacity is often too small to store a complete song once a few virtual tracks have been recorded. The D888 has bravely done away with CD-R/W drives altogether, instead relying on high-speed USB 2.0 to save to a computer. Mixes can still be saved directly to formats such as DAT, via the optical S/PDIF out, or even to an analogue recorder, using the Master out quarter-inch jacks, but USB is the only neat way to perform backups that include song data, Undo data and so on. In reality, when hooked up to a PC or Mac, the D888 performs just like any other digital device, such as a digital camera, scanner or hard drive, enabling the user to access the file structure directly from the computer. The USB implementation worked for the D3200, so Korg seem to have kept things more or less the same. Supported operating systems include Windows ME, 2000 or later and Mac OS 9.0.4 or later. Although the omission of a CD-R/W drive is something that will be off-putting for those who don't involve computers in their music making, it won't worry USB enthusiasts, who are unlikely to miss the hassle and cost of backing up to CD-R/W media and will welcome the saving reflected in the retail price. While discussing the features that exist, it's worth noting that the D888 is missing a few facilities we've come to expect to find in a digital 'studio'. For a start, there's no automation of any kind and no on-board dynamics processors, and what effects there are have been made available as sends only, and cannot be inserted into channels during recording or mixing. The digital editing options are also a little limited, as is the Undo/Redo facility, which has only one level, and (strangely) causes the machine to pause at the end of each recording pass while it creates the Undo data. Also missing is the standard CD-R/W drive (see 'The Demise Of The CD-R/W Drive' box, right), so the product is reliant on its USB connection for backups and saving stereo mixes. In its role as a mixer the D888 also lacks some features. There's no pre-fade listen (PFL) button and neither the in/out sockets nor the channel aux send controls exist for using an external effects unit in a send/return loop. There are also no insert points in any of the channels, making it impossible to use a compressor or limiter after the preamp to protect the A-D converters from signal peaks that might cause clipping — although you could, of course, patch one in-line between the sound source and the D888 input. 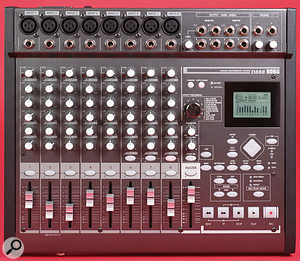 Perhaps the D888's closest rival is Tascam's DP01FX eight-track, roughly modelled on their own Portastudio concept. It too has USB, records 16-bit audio at 44.1KHz to a 40GB hard drive, and has physical controls for EQ, effects sends and pan. Tascam's machine has better MIDI facilities, digital editing options and more on-board effects and processors. At £349, it's cheaper than the D888, but it only records two tracks at once via its limited input options, and has poor metering and just two bands of EQ. Other options currently on the market include the Fostex MR8 MkII, which does away with dedicated mixer-channel controls and the hard drive (although there is a similar Fostex product called the MR8HD with an internal HD). On the up-side, it offers up to 16 virtual tracks, a CD-R/W drive, scene memories and a varispeed control. 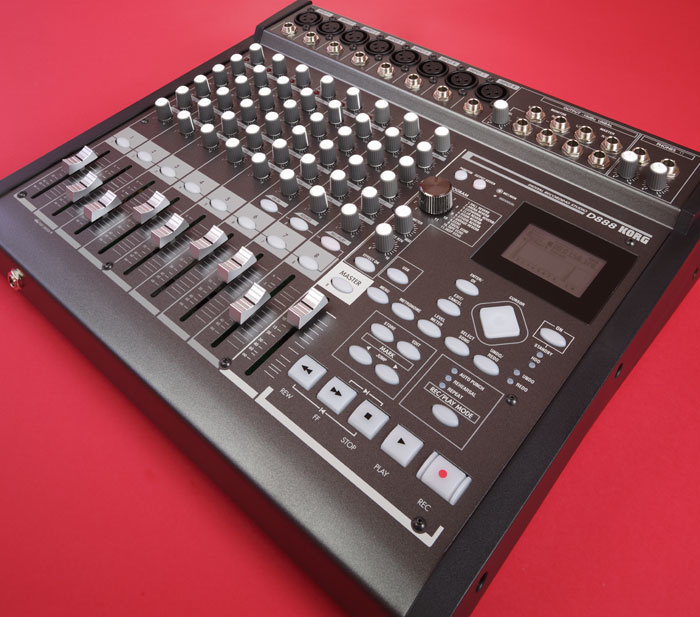 The BR864 eight-track from Boss has an impressive collection of features too, including modelling effects, a rhythm machine, 64 virtual tracks and a Phrase Trainer, but it's short on control knobs and track faders, and it substitutes the hard drive for Compact Flash media. Zoom's MRS802/CD is also a competitor. Although it only records two tracks simultaneously and hasn't the hands-on control of the D888, it manages to include a drum machine, mastering effects, good editing facilities and a basic sampler. When reviewing a multitracker, I often find myself moaning about the screen size. Indeed, the D888's LCD is not much bigger than that of a mobile phone, but this time it really isn't much of a problem, as the demands placed upon it by the design are not huge. Most of the unit's controls are real, rather than virtual, and those that are found in menus can be tackled rather neatly by the control section's four-way Cursor key and self-explanatory Enter/OK and Exit/Cancel buttons. There is one menu where main system setup information is edited, but even when that's being scrutinised the Cursor key enables the user to scuttle quickly up and down the list, selecting or changing the options that appear by the side of each menu item. Most of the other top-panel buttons are traditional transport functions, including marker storing, editing and navigation. Other buttons include one for calling up a metering page and one that flips the record mode between Rehearsal, Auto-punch and Repeat. The D888 has a traditional and very clear control layout. Main channel strips (left) comprise Trim pot and Peak LED, three knobs for High, Mid and Low EQ bands, effect-send level pot for the internal effect, Pan pot, channel on/off button, and 45mm fader. Features to the right of the panel include the small LCD, the rotary effect-selector knob giving access to one of 11 effect treatments, the transport section, and Marker storage and editing facilities. Most facilities have a dedicated front-panel control, minimising menu-surfing. Across the back edge of the front panel are the channel inputs, each with an XLR and a jack socket, and the output section. In one mode, the latter jack sockets can be configured as direct outputs for the D888's eight tracks. A nice touch is two headphone outputs with individual level controls.Punching in and out is easy enough, and can be done either manually using a footswitch or the Record button to trigger the record on/off state during playback, or automatically via the Auto-punch mode. In Auto mode, it's necessary to set In and Out points, which is fairly easily done either by saving appropriate marker points and recalling them on the settings page, or by using the Cursor control to alter the hours, minutes and seconds in the time display and saving the result as the relevant In/Out value. The same procedure is necessary for establishing pre- and post-roll times; unfortunately, the D888 doesn't have a time-saving default setting of something usable like five seconds. Applying the effects is extremely simple. One button turns them on or off, while a large rotary knob is used to select one of the 11 treatments (so obviously only one treatment at a time can be used). Two further knobs provide hands-on control of the parameter value and the effect return level. Exact values can be monitored via the Effects option in the Menu page. The lack of modelling effects and dynamics processors is a bit limiting — although it is better to have a few good effects than loads of mediocre ones that are of little practical use. The on-board reverbs are indeed effective and likeable when used in a mix, but also have a rather irritating artificial quality that becomes evident when their decay is exposed during quiet moments, indicating a lack of effect-processing power. The delays, by their very nature, don't suffer nearly as much from the same artifacts and actually have a rather pleasing feel to them. Accessing song files saved on the D888's hard drive proved extremely easy on my PC. Making a connection is simply a matter of plugging in the appropriate lead and pressing the D888's dedicated USB button. The song folders and WAV files are easy to identify and I experienced no delays in copying songs or viewing data. Soundwise, the D888 is impressive, possibly benefiting from the R&D Korg did when building their flagship D32XD 32-track recorder a few years ago. The preamps, in particular, perform well, providing a clean, full and natural sound. The EQ is effective and seems to mimic the analogue equivalents in a way that digital EQs rarely seemed to achieve not so many years ago. The machine noise generated by the hard drive is low, and not problematic, even when using a mic close by. Perhaps one criticism would be that a little more level should be available from the headphone amps. It's commendable that Korg have kept this product as simple as they have, while still providing a useful set of basic mixing features. 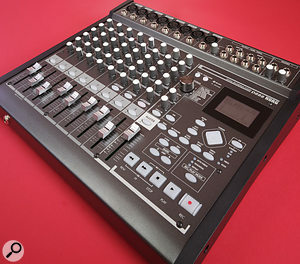 Technophobes who have kept their analogue mixers and recording devices separate may well be tempted by the recording abilities of this machine, particularly as it replicates the layout and setup of a typical small eight-channel mixer in many respects. I would say that the D888 is possibly the easiest-to-use mutitracker I've tried so far. Its user-friendliness is partly contributed to by the fact that it's a bit light on features, but those that do exist are very neatly organised. Even the thin manual makes everything appear more complex than it really is. Having so many physical controls, as opposed to virtual ones, certainly cuts down on menus and button-toggling, but Korg could perhaps have added one or two more options. Typical of many small mixers, there's no EQ bypass switch, making it harder to compare processed and unprocessed signals. Not having a PFL button is less of an issue, but Korg probably should have included another auxiliary send path from each channel so that an external effect could be used to support the basic internal processor. Internal dynamics (or insert points) would also have been useful. 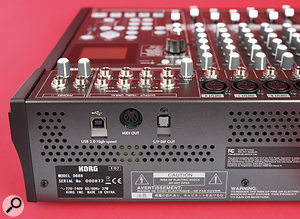 However, the very fact that the onboard effects are basic and that there's no internal dynamics or automation facility, coupled with the unusual presence of individual track outputs in one configuration, may indicate that Korg are thinking of this machine as a multitrack location-recording adjunct to a computer system. They seem to have preferred to give the facility to capture eight uncompressed 16-bit tracks and then output them individually, rather than loading up on internal DSP features. As a result, the D888 is not as polished a 'one-box' self-contained studio as some others on the market, but is arguably more flexible, given the way in which many people work these days, as well as being easy to use. The last factor, in addition, may mean that it will have extra appeal for analogue mixer aficionados who would prefer their music recording to remain fast and simple. Good preamps and recording quality. Can output all eight tracks individually and simultaneously. Two headphone sockets with independent volume pots. No internal dynamics or inserts for patching external dynamics into channels. The lack of a CD-R/W for backup and mastering may disappoint some. A unique product that could be seen as a slightly under-spec'd but easy-to-use 'studio in a box', or as a useful and cost-effective location-recording companion to a computer.